On the night of September 21st I found myself climbing a hill in the Peak District National Park, Derbyshire, with other 29 people. We were heading the Cliff Cavern, a formation from the Carboniferous period, where an exhibition called Digital Dark Ages was curated as part of the Abandon Normal Devices (AND) festival. The group, invited by Barbican, British Council and AND, was there to spent three days discussing the future of art and art institutions in a programme called FIELDWORK. As we went down the cave we could read the written history of Earth’s geology in the layers of stone around us. Somehow, we were to face the unexpected. Our own ‘My God!’ reaction. What we were about to experience was not only a deep connection between fields of knowledge and expression, but the displacement of our very conceptual frames of perception. The experience got me thinking about deep geological time, and I remembered a shifting paradigm in science that took place in the eighties, when the theory of a meteorite impact became the most plausible explanation for the great extinction at the end of the Cretaceous period. It turned out that the scientist explaining how a massive extinction of species occurred were not paleontologists, as everyone –specially paleontologists- expected, but geologists, biologists and geochemists who detected a clay layer with amounts of iridium –a metal found on meteorites- beyond the normal ranges, between two radically different registers of fossils. No one expected answers to the conundrum of the fifth extinction coming from that fields of science, but it turned out that after all evidence supported that theory. If an event is to be seen in the future as a landmark or a turning point, at its present time it’s mostly an anomaly, therefor something that’s going to be distrusted or, at least, interrogated. Giorgio Agamben reflects on the idea of device, tracing back in time the concept of dispositive used by Foucault, as a network of elements -abstractions, technologies and polices-. The components of such a network, following Agamben´s path of thoughts, plays a fundamental role in shaping individuals -as living beings- system of beliefs and feelings. 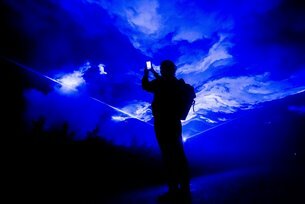 An art festival is also a device for experiencing contemporary narratives rendered by the work of artists who are thinking the world, and by doing that, shaping how we think ourselves within it. As we entered Cliff Cavern I found myself thinking that the art festival device had changed at it’s very core, like if some tectonic plate has moved, shaking the way things are on the surface, but changing the foundations. The themes of this year’s edition were deep time, dis-location, freefall, listening to the dark and strata. The festival took place in Peak District National Park, and boundaries started to fade. The art-festival device rendered itself into its topic of exploration. The works of the artists inevitably became part of the landscape. They were forced to dialogue with the environment, so powerful that left little space for an opinion. And yet there they were, having a voice. 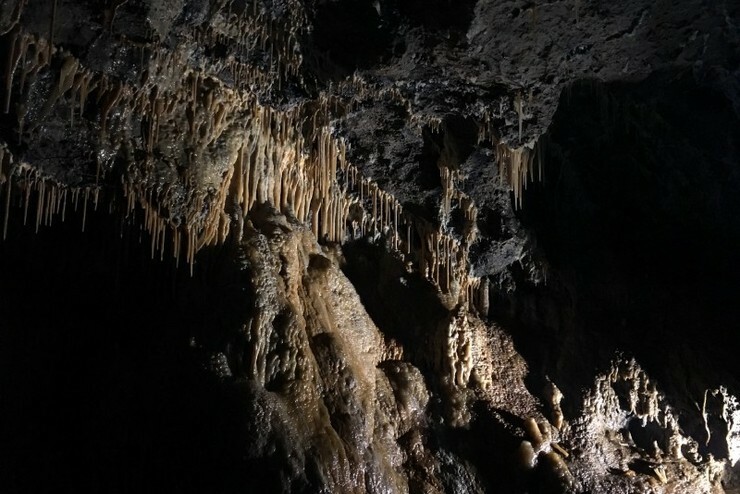 What occurs in a 350 million years old cave where an art exhibition is curated, are displacements and feedbacks in many levels, connecting the environment, the works of art, the artists and the audience in an ecosystem of inter-affection.